Sir Paul McCartney surprised his audience at the London O2 Arena on the weekend by inviting none other than Foo Fighters front man Dave Grohl to join him on stage. Dave joined Sir Paul for the Beatles song “I Saw Her Standing There,” playing guitar and singing along to the chorus. And the duo had another surprise up their sleeves, singing the cult classic track “Temporary Secretary” – a song that hasn’t been played live in 35 years! 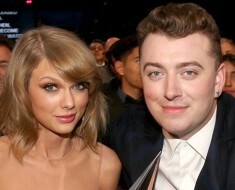 The two have met before and performed together at the 2009 Grammy Awards with Dave on drums. He also participated in an unlikely collaboration with singer Rihanna (27) and rapper Kanye West (37) for the song “Four Five Seconds.” The trio donned black suits for a performance of the track at the Grammy awards. This song was his second collaboration with Kanye. The first, “Only One,” was inspired by the Beatles song “Let It Be,” Kanye has revealed.